Where all the other rabbits on Gold Gorse Common were brown rabbits with little white tails, Sammy Lippin was snowy-white all over! And because his white fur made him so easy to see, foxes, weasels and badgers chased him more than any other rabbit on the common. Indeed, Sammy became so afraid that one day he’d be caught and made into rabbit stew or rabbit rissoles or rabbit pie, he decides to run away from home. On his journey, Sammy meets a white kitten called Tomasina Tabbit who is busy crying her eyes out. Sammy soon learns that she too is made miserable by the colour of her fur. Tomasina bemoans the fact that, unlike the rest of her family, who have ginger fur, her own whiteness means that she is unable to catch rats as they can see her coming from a long way off and run away. Sammy knows just what it’s like to stick out from the crowd and suggests that Tomasina join him in running away to see the world. Together they meet a large, rather fierce-looking black cat dressed in a Khaki uniform. His name is Archibald Thomas Soot and is a Quarter Master Sergeant in charge of the army’s food stores. His job is to catch rats and keep them from eating up the food. Sammy and Tomasina are soon persuaded to “Join the army and see the World.” More importantly, they are each given a greeny brown coat to wear – just like Archibald’s. 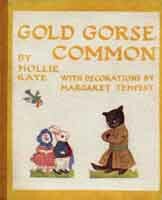 Then one day the army decamped and so Tomasina and Sammy decide to return to their respective homes: Tomasina to the Farm “to show those civilian cats how we catch rats in the army;” and Sammy to Gold Gorse Common. There he starts an army class and makes plans to rid the common of those troublesome foxes, weasels and badgers. By organising sentries to warn the other rabbits whenever danger threatened and by setting various traps, the rabbits manage to force these unwanted creatures to leave the common for good. Both Tomasina and Sammy lived happily ever after.